The Valley of the Queens is located on the West Bank at Luxor (ancient Thebes). There are between 75 and 80 tombs in the Valley of the Queens, or Biban al-Harim. These belong to Queens of the 18th, 19th and 20th Dynasties. These include The Tomb of Khaemwese (Tomb 44): Scenes in Khaemwese's tomb show him being presented to the guardians of the gates to the afterlife along with his father. He is making an offering in the scene, and is dressed in a robe, wearing a necklace and the sidelocks of youth. The Tomb of Queent Titi (Tomb 52): She is probably the queen of a 20th Dynasty. She is depicted with the sidelocks common to the Egyptian young of the period and in the presence of the gods Thoth, Atum, Isis and Nephthys. In the next chamber the queen is shown making offerings to Hathor the cow, and in the last chamber the gods Neith, Osiris, Selquit, Nephthys and Thoth. The Tomb of Amenhikhopeshef (Tomb 55): Amenhikhopeshef was a son of Ramesses III and scenes show him with his father and the gods Thoth, Ptah and others. He was probably about nine years old when he died. Scenes show him being presented to various gods, including Anubis, the Jackal-headed god of the dead, by his father, Ramesses III. A premature baby was also found in to tomb. This belonged to this mother, who aborted upon learning of Amenhikhopeshef's death. The Tomb of Nefertari (Tomb 66): One of five wives of Ramesses II, Nefertari was his favorite and the tomb here has been is said to be one of the most beautiful in Egypt. The tomb is completely painted with scenes though out. 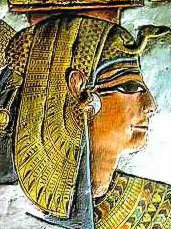 In most of these, Nefertari, known as 'the most beautiful of them', is accompanied by gods. She is usually wearing a golden crown with two feathers extended from the back of a vulture and clothed in a white, gossamer gown. Be sure not to miss the side room where one scene depicts the queen worshipping the mummified body of Osiris. Near the stairs to the burial chamber is another wonderful scene with Nefertarti offering milk to the goddess Hathor.